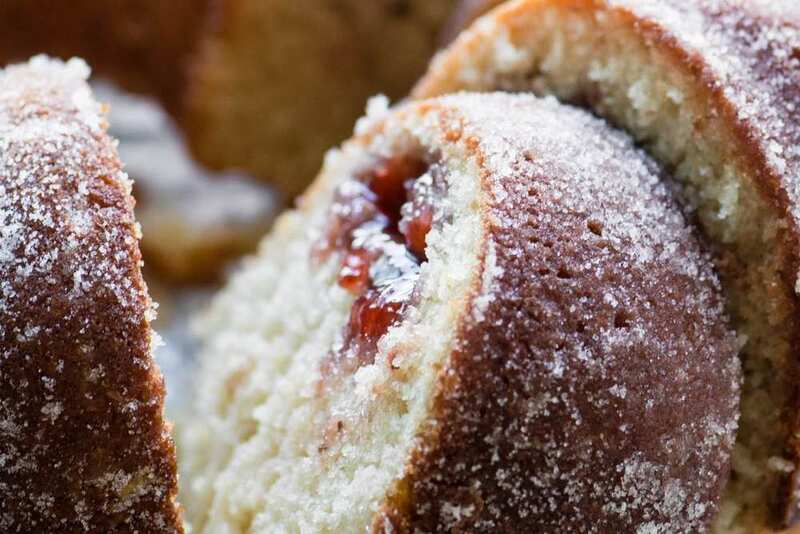 My Jelly Doughnut Bundt Cake is jelly doughnut meets bundt cake for a unique morning or mid-day treat. This comforting cake begs for a cup of coffee or tea. Pour the batter into the prepared pan. Add small dollops of jam to the center of the batter, all around the cake. Take a long skewer or chopstick and gently pull it through the jam, just to break up the blobs a little bit. Don't swirl too much. Bake for about 50 minutes, until a toothpick inserted near the center comes out without wet batter clinging to it. Set the pan on a cooling rack for 15 minutes. Invert the cake onto a plate. Brush with the melted butter, and sprinkle very generously all over with the sugar. I like to cup the sugar in my palms to get it to cling to the side of the cake. The more sugar you can get on the outside, the better.